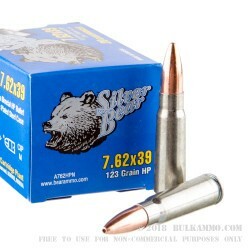 This 7.62x39mm ammo is an economical way to get 500 rounds of versatile Russian-made ammo. 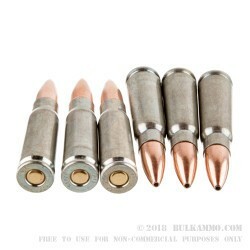 Great for plinking and range training, the 123gr hollow point (HP) projectile makes this a viable option for hunting medium-sized game as well. The HP projectile has a bi-metal jacket and will attract a magnet. This 7.62x39mm is Berdan-primed and coated with zinc-plated steel designed to prevent corrosion while still being less expensive than typical brass-cased ammo. This ammo functions well in the chamber, and the zinc-plated steel will not damage your firearm. The casings are not reloadable and meant for shooters who would rather discard their spent casings in exchange for a lower price. 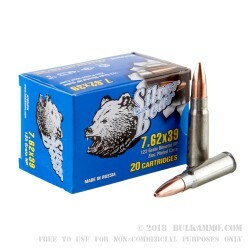 Silver Bear ammo is produced at the Barnaul Ammunition Plant in Barnaul, Russia. The company has gained a strong following of American shooters who enjoy the value and performance of steel-cased ammo. Order your 500-round bulk case today! This runs great through my RAS47. Not the most accurate, but it goes bang every trigger pull. No hangups at all with 300+ rounds. It is dirty ammo. So cleaning is recommended after each session. Q: Do the projectiles have any steel in them? (our indoor range won't permit steel rounds). Thanks. A: Hello Scott! 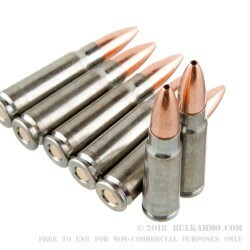 This ammunition is loaded with a bi-metal jacket projectile. As a result the jacket is made by pressing together layers of copper and steel. As a result, this round will not be able to pass any type of magnet test. Q: Non corrosive? Full metal jacket? Lacquer? A: Hello Kenneth, This ammunition is a Hollow Point projectile loaded with non-corrosive components in a zinc-plated steel case.